Day 1468 - So long, February! Happy Last Day of February! Bring on March, bring on Savi's birthday, and bring on SPRING! Have you noticed how much lighter it is in the mornings now? I love that! Of course, the time change is coming up soon, on Sunday, March 14th. 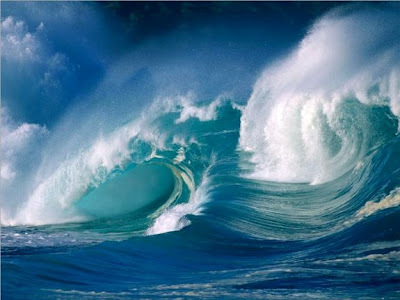 I chose a wave photo this morning because a tsunami did NOT hit Hawaii yesterday. I am glad that was a false alarm. What's with all the earthquakes lately anyway? We have earthquake coverage, by the way - I am beginning to think that is a good idea. Tennessee is listed as 'High Risk' by FEMA for earthquakes. TTFN and have a nice last day of February! Day 1467 - Ahhhh, the weekend! 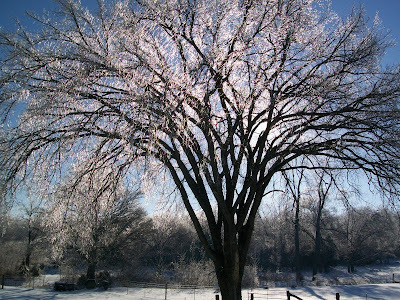 Here's another awesome winter scene - I think the snow at the bottom looks totally cool, don't you? The lighting was just right to make a shadow effect on the snow. One week from today is our darling Savannah's second birthday! Can you believe that TWO YEARS have gone by since she was born? I can't! Yesterday in the pool an 18-month old was having a swim lesson - if you could call it that - she was NOT happy. The instructor told me after the lesson that the little girl wanted to go to ME to get away from HER. I thought that was funny, being a complete stranger. The only time I heard the little girl speak was when she saw the lifeguard, George. She piped up with 'Who's that guy?' See - George rocks with the ladies, even the toddlers! Day 1466 - More Snow and Cold! If I wake up in the night, I always look at the time. I often wake up at 3:33, but last night I woke up at 4:44, and the other night I woke up at 2:22. It is EIGHTEEN degrees here this morning, and yesterday it was TWELVE. Good grief. I heard on the news there was more snow in the Smoky Mountains, I am sure it is glorious! The average high for this time of year should be high 50's BUT NO... We're lucky this year if it makes it into the 40's. You know - Icicle is a weird looking word, isn't it? We saw SO many beautiful icicles when we were in the mountains. They were everywhere, and all different sizes and shapes. Icicles are beautiful, but dangerous too! That reminds me of a trip Charlie and I took to Pickett State Park in Tennessee some years ago (that's because we can't remember how many years it has been). We went hiking to a cave that had huge, overhanging icicles at the entrance. While we were inside the cave, one FELL, and burst with a sound like a cannon going off. It was quite scary! If a hiker had been where that huge icicle fell, they would have been injured and possibly killed. So - the moral of the story is - do NOT take photos of icicles while standing UNDER them, be sure you aren't in the 'falling ice zone'. There's no middle of the road in this picture - it features SNOW and of course, the King of the Snow Pile. I just can't explain how disorienting it was for me to see this in Tennessee! I loved it, though. I remember the Blizzard of '78 in New England when we had five feet of snow. That was by far the biggest single snow event in my life. People were walking by at WINDOW level - talk about disorienting. You could not see the cars under the snow, and plows couldn't handle the depth of the snow. After a few days, I needed milk and bread (of course), so I made a sled out of a plastic baby washtub and walked a couple miles to Thayer Street to the closest market. I think all they had was dry milk, but that was better than nothing. My ex was working for the city of Providence at the time, and someone came to get him on a snowmobile and bring him to work. How's THAT for city transportation? 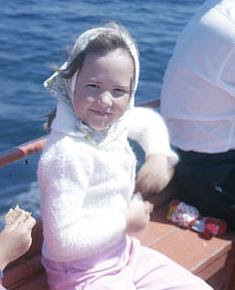 Looking back - why didn't THAT guy bring me some milk and bread? Day 1463 - Twofer Tuesday and Another Birthday! S.Y. and T.Y. are always up for a dinner out or a getaway, and we appreciate that! Happy Birthday! Here is a Smoky Mountains waterfall photo from a lower altitude - this one is found on the drive between the Gatlinburg visitor center and Townsend, TN. Do you want to see more snow pictures? I keep forgetting to post a funny that Charlie said the other day. He was referring to a recent visit at the dermatologist, but referred to the dermatologist as his taxidermist! He got the 'derm' part right, but you'd have to have been there to appreciate how funny that was! Only Charlie would even HAVE the word 'taxidermist' in his list of often used vocabulary words, and the thought of Charlie having a taxidermist as one of his doctors is hilarious. Well, it's dollar popcorn day again at the movies - we are going to see 'The Wolfman' today. Has anyone seen 'Shutter Island' yet? TTFN and enjoy your Tuesday! Day 1462 - Monday, Monday! We are back home from the frozen tundra of the Smokies. What a treat it was to enjoy the beauty of deep snow while enjoying pleasant temperatures and mainly good road conditions. I can't describe how pretty the snow and ice was, clinging to the trees, mountains, and rocks - you'll have to just believe me and see the photos. I should also brag that my Honda CRV 4-door color white performed magnificently on any tricky road surfaces. Good job, CRV! Day 1461 - Snow, snow, come out in the snow! Do you recognize me in these photos? Can you BELIEVE all this snow is found in the state of TENNESSEE? I have a hard time believing it, and I was there!! Yes, up in the Smoky Mountains of Tennessee - snow and ice is alive and well. The deep snow photo was taken near Newfound Gap in the Smokies at an altitude of approximately 5000 feet - not that far off from DENVER, COLORADO! So - in the mountain passes, snow and ice abound, but we had 50 degree weather and bright sunshine at lower elevations. Seeing all that snow while NOT sliding off the road was AWESOME, and we had a great time. Day 1460 - Happy Birthday, Heather! You KNOW that I am going to get in big trouble for posting this picture, but it's just too good for me to pass up! Here is Heather, sitting in the rain in Nashville at the 2005 Fan Fair country music festival, and not very happy about it. 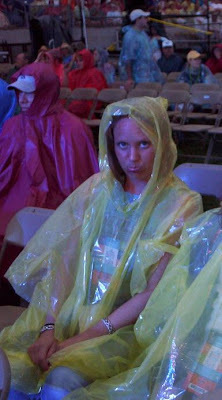 It always manages to rain during the festival, and there is nothing more uncomfortable than those plastic dollar ponchos, though wearing a trash bag is a close second. I think I've seen Savannah with the same expression, yes? Heather was born around 2 in the morning, and I had been in labor since the previous morning. I wonder, if I'd had her in these modern times, whether I would have ended up with a C-section? Heather was, bar none, the most beautiful baby ever. She arrived (natural childbirth no less), rosy and happy and smiling as soon as she was born! It was amazing, she was perfection itself. Happy Birthday, Baby Girl! Have a great birthday and a great year! Day 1459 - Friday and Birthday Eve! That's RIGHT - it's FRIDAY, and for some people, Friday of a short week! I forgot to remind everyone of Survivor last night. Did you watch it? We usually aren't crazy about the 'star' ones they do. I would rather see new contestants rather than ones I already may know and hate. That said, we are enjoying it so far this year. Have you seen the previews for the new 'Robin Hood' movie coming out, starring Russell Crowe? It looks very DARK for a Robin Hood movie. Day 1458 - Friday Eve! Greetings, Bloggy TGIFers Minus One! It is Friday Eve - and I'm creeped out. We rented a movie named '1408' the other day. It is one creepy, scary movie. Have you ever been watching a scary movie and had something scary HAPPEN? That's happened to me a couple of times. It happened once when I was watching the Exorcist (at home, alone). The only light in the room went out at the MOST SCARY PART. I don't think I ever got over that. You had to scrape me off the ceiling, but if I recall correctly, I didn't SCREAM. So - back to the movie 1408. It is a story about a ghost story writer who checks into the scariest hotel room ever, room 1408 of the Dolphin Hotel in New York City. We took a 'break' during 1408 so I could make dinner. Dinner was to be rotisserie chicken subs with bacon, lettuce and tomato. I started to slice up the tomato for the subs and was horrified to find that the tomato seeds inside the tomato had started to sprout! They looked like little worms falling out onto the counter, and totally creeped me out more than I was already! I threw away the tomato and sliced another. SAME THING HAPPENED. Long story short - we had subs with no tomato on them and finished watching the movie. I pretty much lost my appetite too. I may never buy tomatoes again. Day 1457 - Happy Birthday, Lyn! Today is my sister Lyn's birthday. Happy Birthday, Lyn! Be sure to get your birthday spankings, or put butter on your nose as you have a shiny new year. Do you know the birthday 'buttered nose' ritual? My former mother in law, who was swedish, taught it to me. I looked it up on the web, and it really is true! Lyn is younger than me, by the way. Don't tell anybody. Yes, that's right - my sisters name is spelled with one 'n', not two. I see two n's more often than one, actually! Mom - is there a reason why Lyn's name only has one 'n'? The entire world wants to know. Happy Birthday, Lyn - have a great day and a great year! TTFN! Greetings, Bloggy Mardis Gras Celebrants! 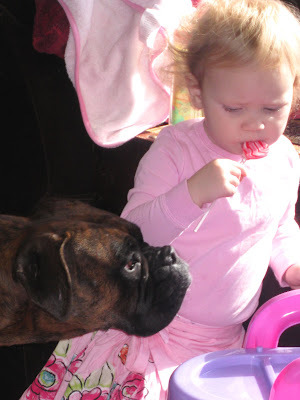 Here's Miss Savi and the dog in another Valentines Day picture, and both of them are interested in that lollipop. If you had the day off yesterday - did you enjoy your day? I missed receiving any mail, but I'll recover. By the way; the big post-Valentine candy and gift clearance should be going on right now. If you need anything - now's the time! Charlie and I picked up some Valentine clearance yesterday - but it wasn't chocolate, it was CRAB! We bought some frozen King Crab legs at Walmart that were marked down to $11 for 1.5 lbs. That's a really great price for King Crab. I don't know when I am going to cook them, but I will say that I like King Crab almost as much as lobster, and they aren't too much work because they're so big! We've been having snow showers for the last couple of days - maybe an inch or so total but schools are closed (big surprise!). When the schools are closed, everyone seems to hit the health club and/or the movies. And speaking of movies... Today is dollar popcorn and dollar drink day at the movies, so we might go see 'Percy Jackson and the Olympians' this afternoon. TTFN and have a nice Twofer Tuesday! Day 1455 - Happy Presidents Day! 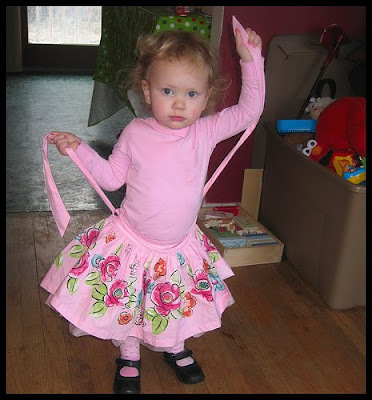 Here's our adorable Valentine girl, Savannah, looking totally cute even though she was sick. Many people have Presidents Day off today - congratulations if you do! Most of the jobs I have had do not give Presidents day off. We don't even get mail today... bummer, dude. Do you LIKE to get mail? I do! The arrival of the mail is a highlight of our day, even if there isn't anything especially interesting in it! I love to see what MIGHT be there. Speaking of the mail - I fully intended to get my taxes into the mail this weekend, and I didn't do it. AGAIN. No point in getting them done TODAY - because THERES NO MAIL. TTFN and enjoy the day off if you have one! Day 1454 - Happy Valentines Day! I couldn't decide whether to show more chocolate today, or the heart shaped pizza, so I settled for BOTH. We are supposed to get snow today and tomorrow - this has been a very snowy winter for the South, hasn't it? When I see the aerial view of Vancouver, I don't see snow, and they keep saying it is raining there! Nancy - good luck on your moving, and say Hi to Debi! Heather - hope Savi feels better today! Hugs to all my Valentines - and TTFN! Day 1453 - Valentines Eve! Greetings, Bloggy Valentines and Cupids! 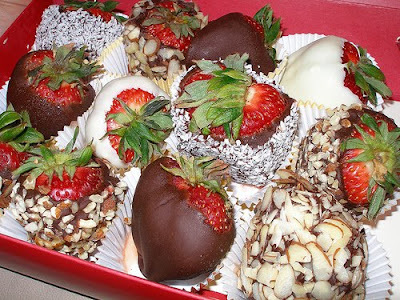 I don't know why I haven't put up more chocolate photos this week in honor of Valentines day. 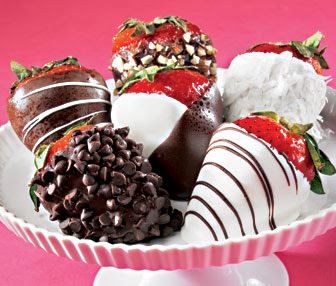 Doesn't chocolate go hand in hand with Valentines? Charlie has my Valentine chocolate hidden away until tomorrow so I won't EAT it until then... Thank you, Charlie! Today we are meeting Buddy Joe at the Mellow Mushroom Pizza place where we went on New Years Eve... I guess it's now a Valentines Eve meeting place as well? 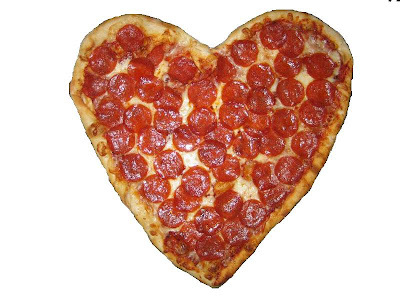 So - everyone tell us what you are doing for Valentines Day. Charlie and I are going to enjoy Valentines dinner at home tomorrow night instead of going out - the restaurants are too crowded! We might hit a movie too - not sure about that. TTFN and have a nice Valentines Eve! Get well, Savannah! Day 1452 - Friday, Hooray! 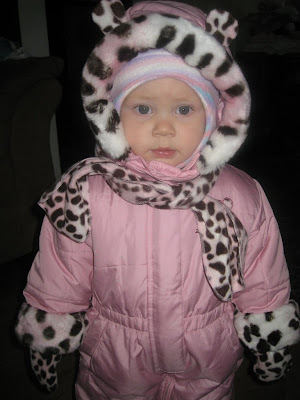 Here's another cute winter picture of Miss Savannah. 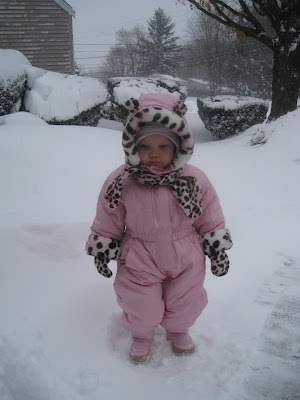 I just love this snowsuit, and I know I've said that before. Another gray day here - 25 degrees. I heard that Dallas, TX just had a record amount of snow, and it missed us, thankfully. We might get another round of winter weather late this weekend. I am running late this morning but I have done a wash and eaten breakfast - does that count? I need to move along and make this short. Survivor's Season Premiere was entertaining last night, and don't forget that the Amazing Race will start again on Sunday night. Don't forget to pick up all your Valentine goodies before Sunday. Send me some, of course! TTFN, have a nice Friday, and a nice weekend, and a Happy Valentines Day! Day 1451 - Hey! I haven't mailed in my taxes! 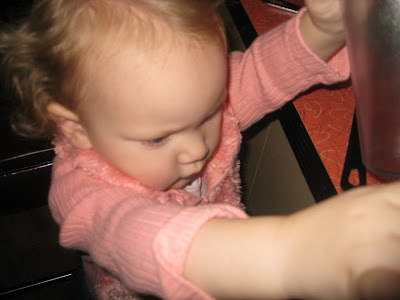 Here's a closeup of Miss Savannah, hard at work in the Childrens Museum. She'll be a taxpayer someday! 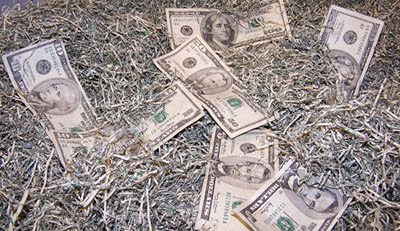 Charlie and I did a preliminary 'tax-sweep' a couple of weeks ago, to see if we would be getting refunds. If you recall, last year I was disappointed and griping because I had to PAY IN and didn't get a refund. However, this year we are both due a refund. So tell me why we haven't finished them up and mailed them? I guess it's too easy to procrastinate and put things off rather than the 'Git Er Done' mentality. Put another item on the to-do list I guess, and then actually work that list! TTFN and have a nice Thursday! 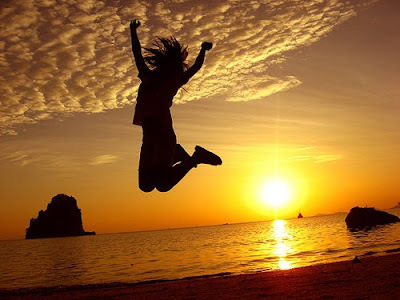 Tomorrow's Friday, Hooray! We didn't actually get much snow yesterday but many school systems closed. It really felt bitter all day long though, and there were periods of flurries all day. Guess what? On our THIRD TRY, we finally saw Mel Gibson's Edge of Darkness movie. It was pretty good, I'd give it a 3 out of 5. The plot had some twists and turns, and the acting was so-so, including ol' Mel's. I am looking forward to Percy Jackson and the Olympians: The Lightning Thief. It starts this Friday. It is about a boy who turns out to be the son of Poseidon, and is half human and half god. He has to help save the world with a few other demigod teens. Sounds fun to ME. Day 1449 - More snow? Is this the South? Greetings, Bloggy 'When is Spring Ever Going to Get Here' readers! Just a dusting for our area with some sleet on top, but some places in Tennessee have 6 inches, and a lot of schools are closed yet again. I thought a snow picture of Miss Savannah was appropriate for today. Subtle hint: We need new pictures! We need new pictures! I just polished off a bowl of hot oatmeal with milk and bananas on top. That is a winter breakfast for sure. My mother hates oatmeal and used to feed hers to the cat. I don't like cream of wheat, but I do like any other kind of grain-mix hot cereal like Maypo and the stone ground grainy ones. I have some in the freezer, where it stays fresh. I also throw in dates, raisins, cranberry raisins, etc. By the way - new product annoucement: Raisinets are making chocolate covered cranraisins now! We bought a bag but I haven't opened them, they are put away for Valentines day. If you have a big freezer, you can freeze potato chips, cereal, crackers, flour and 'bagged items' and they stay perfectly fresh. Did you know that? Works great. There is a debate about whether you should freeze coffee, but I do and it works fine for me. I LOVE my freezer. Have a nice Tuesday and stay warm! It is not supposed to get above 30's here all this week. Day 1448 - The Saints Go Marchin' In! Yes, the Saints are marching in New Orleans - they played a good game and won by two touchdowns. We had a great time, snacking and watching. Thanks for having us over, TY and SY! 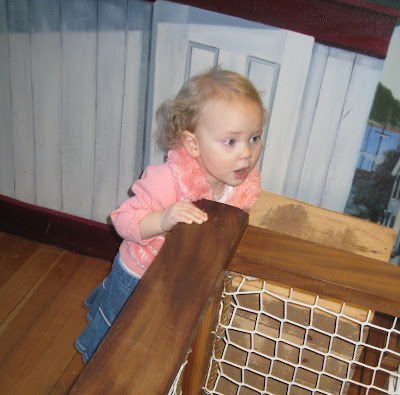 Here's another cute picture of Savi at the Childrens Museum. She just loves it there, doesn't she! Heather - do you have a membership or do you have to pay to get in each time? Day 1447 - Superbowl Sunday! 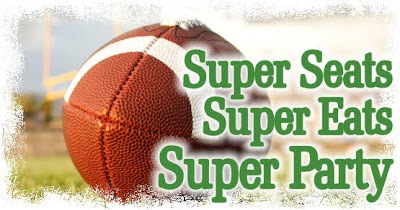 It's Super Sunday! Who do you want to win? I like Peyton Manning, so if the Colts win, I am OK with that. I also like to root for a team who has never been in a Superbowl, so if the Saints win, I am OK with that. That means I am going to enjoy the game, no matter what. The grocery stores were JAMMED yesterday, it seemed like Christmastime. I was wise cracking at the register because I had to take out and show my drivers license to buy Charlie some beer. My grocery bagger then got so enthusiastic about taking my grocery cart out to my car, that he swung it around and bopped his BOSS with it. Oops. I soothed him by saying 'You were helping a customer, your boss took one for the team'. We're going to TY and SY's to watch the game - thanks in advance for inviting us! TTFN and have a great Superbowl Sunday, whether you watch or not! Day 1446 - Superbowl Eve! 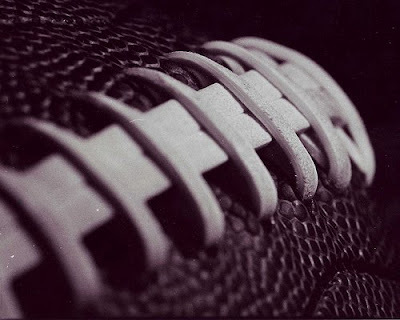 Superbowl is TOMORROW - are you ready? Charlie and I tried for the second time to see Mel Gibson in 'Edge of Darkness' yesterday, and we were foiled AGAIN! The first time they were having technical difficulties with the 3:05 show. Yesterday, we arrived in time for the 3:05 show and there WAS NO 3:05 show. We didn't feel like hanging around till 4:15, so we decided to try again next week. Sheesh. We saw a Netflix movie instead, and we both liked it very much. If you haven't seen 'The Changeling' with Angelina Jolie - it is good and based on a true story. Gotta go - TTFN and have a nice Superbowl Eve! Day 1445 - Friday and a Birthday! I just love this picture, it really looks like Friday to me, dontcha think? It is also our friend TY's birthday. Happy Birthday!!! Charlie and TY are going out for breakfast - doing the Birthday Romeo Club thing. If you don't remember what the 'Romeo Club' is - ROMEO stands for 'Retired Old Men Eating Out'. That is one of the funniest things I've ever heard, and I tell people about the ROMEO Club all the time. Have a wonderful Friday and a great Superbowl Weekend! TTFN! Day 1444 - Friday Eve, Already! Greetings, Bloggy Waitin' for the SuperBowl Weekend-ers! 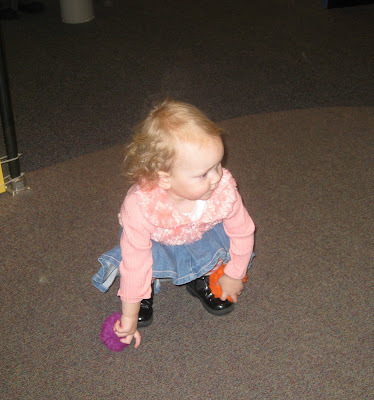 Here's a cute photo of Savannah, playing at the childrens museum. 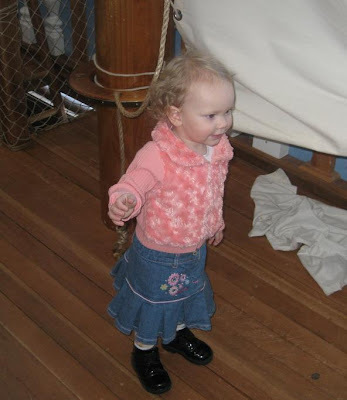 Look at her cute little shoes! She's TOO adorable. I have a couple faux pas to share from yesterday. Faux Pas #1: A lady at the health club showed up for water aerobics class yesterday. There are no water aerobics classes on Wednesday. She thought it was Thursday. Faux Pas #2: Word to the wise. Do not park in a spot that is next to a snow bank. You know why? YOU CAN'T OPEN THE CAR DOOR. Did I think of that when I pulled into the spot? No, but very soon after I did.... DUH!!!! Guess I'd better go before I humiliate myself further. TTFN! Schools have been out since Friday, and the snow and ice is slowly melting. However - our driveway turned out to be a slippery slope the first time Charlie took his pickup (which is not 4WD) out. 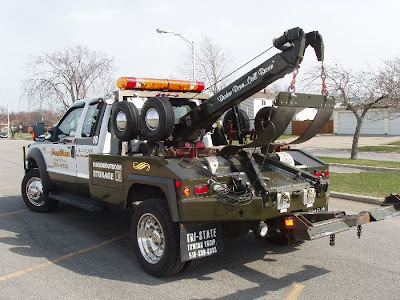 Making a long story short - today a AAA tow truck came and pulled Charlies truck off the side of the driveway, where it had been stuck since the day before. The tow truck driver actually had to pull it out multiple times. The truck kept sliding right back into the 'stuck' position as soon as Charlie tried to drive it back to the garage, thanks to the ice underneath the snow. Kind of like the groundhog seeing its shadow and jumping back into its hole. I would like to thank my Honda CRV 4-door color white (with 4WD) for being so good in the snow! Greetings, Bloggy Spenders and Savers! I am sure that someone else has had the same idea, but if I am the first, then all the politicians should give me credit, and make it happen. I had this idea while doing my taxes (You may just be thinking about doing your taxes at this point). Right on the tax forms there are boxes to donate to the Presidential Election Campaign fund. I think 'The Gov' should dedicate some IRS form real estate and add one of those boxes for an elective amount (with a default amount like $3) to help pay down the federal deficit. I know that for ONE person, that's not going to make much of a dent. However, if LOTS of us taxpayers did it, and there are millions of us, it would make a huge difference. With all the dollars we put into buckets for the Salvation Army, or Goodwill, or any of the many of charities we donate to, would you allocate a few dollars to help get our country out of the red? I'd do it. Feel free to pass on my idea, yes, I know you can argue that the SPENDERS get us into these messes, and the public shouldn't be the ones to fix it, but you know what? I think we're ALL entitled to help fix a problem, and that's my idea. It's a new week and the first day of February. Spring is right around the corner (she says as the snow and ice is gleaming in the yard). Two weeks until Valentines Day - stock up on the chocolate now! Have I mentioned that we are enjoying our Netflix subscription? We have two movies, and keep them going back and forth all the time to the Netflix distributor. It is all done with the internet and the mail, and all postage paid. My 'rental request queue' is on the internet, and when we mail one in, the next one in the queue is mailed out pronto. We watched a so-so alien movie last night named 'District 9'. It was different, but I'm glad we didn't spend money at the movie theatre for it. I like Netflix because we can turn the movies around quickly, and don't have to go to a store. How they can afford to pay all the postage is beyond me, but no complaints from us! I had a coupon for 'Charmin Basic' and bought a package. HUGE MISTAKE. If you are used to Charmin Ultra (like we are), Charmin Basic is like using thin, scratchy tree bark. Not good, and I will never buy it again, even with a coupon.